That ad for Ameriquest Mortgage Company—named one of the best of 2005 by "Adweek" magazine—featured actress Shawnda Thomas, a Hollywood up-and-comer. Thomas wears her natural hair proudly for auditions and acting roles. And it hasn't hurt her one bit. Thomas has also appeared recently in commercials for Southwest Airlines (she's the one who accidentally walks into the men's restroom) and Sears. In the latter, she convinces her 'husband' to buy a new refrigerator after he sneaks a carton of milk out of their current appliance, drinks some and discovers it's spoiled. Although the predominant hairstyle among black women in the entertainment industry is a stick-straight coif -- often created with extensions or wigs -- women with natural hair can find some work in Hollywood. T'Keyah Crystal Keymah, best known for her roles in the early '90s sketch comedy 'In Living Color,' is familiar to the younger set as Raven-Symone's mother on the Disney Channel series 'That's So Raven.' In the music industry, singers like Nadia Turner, Macy Gray, Erykah Badu and Jill Scott are known for their natural locks. Women with 3C hair, like Gloria Reuben of 'ER' or Tracee Ellis Ross of 'Girlfriends' are more likely to be shown, however, than those with kinkier hair textures, although that's changing with the appearance of actresses like Keymah on mainstream television programs. And commercials seem to be one of the best places for natural actresses to break in, as shown by Thomas' experience. Thomas has been repping for the 4s on the small screen, making a nice living starring in such national commercials. She has also had roles on television, and hopes to make it big in film and theater. In her case, going natural helped her career. When Thomas worked in Miami and Orlando, she often booked roles wearing braids. When she moved to California, however, she was told that look wouldn't work. So she switched to a relaxer, but soon discovered that the straight style didn't open doors either. In 1999, Thomas discovered the straw set and twists and alternated those styles with press-and-curls, letting the relaxer grow out. Instantly, the jobs began coming her way when she auditioned with her new 'big hair'. One year she appeared in six commercials. The next year it was eight. Then 12. Being different set her apart. It has also helped her on the set of her shoots. Her hair is already done when she appears on set, saving time in the stylist's chair. Eventually she earned the Holy Grail of commercial jobs -- the national union spot. When an actor books a Screen Actors Guild (SAG) commercial, he or she is guaranteed residuals every time the ad airs in any market nationwide. Multiply that residual fee by the number of potential airings for a national commercial -- and also factor in a complicated formula that increases the residual payments according to the sizes of the cities in which the commercial airs -- and actors have a chance to make tens of thousands for one commercial. Thomas' numerous national ads have allowed her to live comfortably in Los Angeles without having to take on the typical 'struggling actor/actress' jobs that so many hopefuls need to survive. She's able to use her free time to pursue her love of theater and work to earn roles in major films. In addition to Southwest Airlines, Ameriquest and Sears, she has done ads for McDonald's, HGTV, Lays, Albertson's supermarkets and the birth-control pill Seasonale. 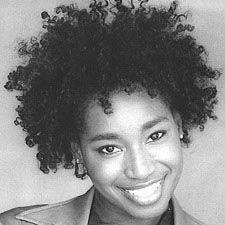 She also appeared on the television show Moesha. Going natural hasn't been an easy journey for Thomas. Like many new curlies, she had to learn how to take care of her hair in its natural state. She also struggled with damage that came after using Rio, a so-called 'natural' relaxer that usually resulted in users losing a significant amount of hair. Today, she uses products from Lush, particularly the H'suan Wen Hua pre-shampoo treatment, Cynthia Sylvia Stout shampoo and Retread conditioner. She also loves Sally Beauty Supply's Silk Elements Revive and Restore Oil Moisturizing Lotion and the Goldwell Kerasilk line. For a finishing touch, a few drops of Kemi Oyl and Wildgrowth oil help keep her hair moisturized and provide shine to keep her style looking great on camera. When Thomas goes for auditions now, she's no longer the only curly girl in the room. Although that means more competition for those coveted commercial roles, she's proud of the fact that she has been a pioneer for natural hair in the commercial industry.